Chiles are often used simply as vehicles for culinary heat, but they actually have complex and piquant flavors in addition to this heat. Jalapenos are reasonably hot chiles that can be used in salsas, stuffed with rice and meat, or simply sliced and used as a condiment. Like sweet pepper varieties, jalapenos turn red as they ripen. The ripening process does change the flavor, although its effect on a pepper's hotness depends on a variety of other variables including weather conditions and the genetics of the particular plant. Like red bell peppers, the flavor of red jalapenos grows sweeter and brighter as the plant matures. There is some disagreement about whether ripening affects the heat level of red jalapenos, perhaps because the heat level of jalapenos varies considerably even among jalapenos of the same color. You can use red jalapenos in any dish that calls for green jalapenos because they are essentially the same plant and their flavors are more similar than different. Red jalapenos make an attractive topping for nachos and bean dips, and their bright, sweet flavor adds an extra dimension to salsa. Using red and green jalapenos together makes a dish more colorful and visually appealing; this attention to presentation also showcases the natural variety that peppers offer. The heat in red jalapenos, like the heat in other chile varieties, can't be measured mechanically; rather, it can only be detected by the human tongue. Chile heat is measured using the Scoville system, named after the researcher who devised it. This measurement system involves diluting the chile with water and then feeding it to research subjects to determine whether they can still taste the heat. The number of times the chile needs to be diluted before the research subjects can no longer taste its heat corresponds to its Scoville rating. 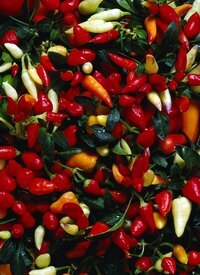 The heat of red jalapenos ranges from 3,000 to 8,000 Scoville units. Because red jalapenos ripen only at certain times of year with specific weather conditions, they tend to be more intermittently available than other chile varieties such as green jalapenos and serranos. Choose firm red jalapenos rather than older, wrinkly ones. Sometimes red jalapenos develop a web-like pattern on their skin that looks like they are cracked, although the skin remains smooth to the touch. Red jalapenos with this skin pattern tend to be hotter than those that are solid red.